Here is the trailer for the upcoming film POLTERGEIST. The movie is directed by Gil Kenan, starring Sam Rockwell, Rosemarie DeWitt, Jared Harris, Jane Adams. POLTERGEIST hits theaters JULY 24, 2015! Here is the new poster from the upcoming film THE QUIET ONES. The film is directed by John Pogue, starring Jared Harris, Sam Claflin, Erin Richards, Rory Fleck-Byrne, and Olivia Cooke. 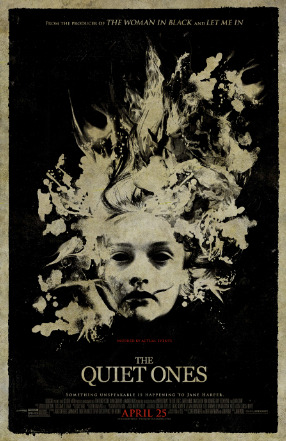 THE QUIET ONES In theaters APRIL 25th, 2014. Here is the from the upcoming film THE QUIET ONES. The film is directed by John Pogue, starring Jared Harris, Sam Claflin, Erin Richards, Rory Fleck-Byrne, and Olivia Cooke. A university student (Sam Claflin of The Hunger Games: Catching Fire) and some classmates are recruited to carry out a private experiment — to create a poltergeist. Their subject: an alluring, but dangerously disturbed young woman (Olivia Cooke of Bates Motel). Their quest: to explore the dark energy that her damaged psyche might manifest. As the experiment unravels along with their sanity, the rogue PHD students are soon confronted with a terrifying reality: they have triggered an unspeakable force with a power beyond all explanation. Inspired by true events, The Quiet Ones is directed by John Pogue from a screenplay by Craig Rosenberg and Oren Moverman and John Pogue, and based on a screenplay by Tom de Ville. Here is the teaser trailer from Focus Features’ upcoming film “The Boxtrolls”, opening in theaters everywhere on September 26, 2014. The film is directed by Anthony Stacchi and Graham Annable, starring Ben Kingsley, introducing Isaac Hempstead-Wright, Elle Fanning, Jared Harris, Toni Collette, Nick Frost, Richard Ayoade, Tracy Morgan, and Simon Pegg. The new 3D stop-motion and CG hybrid animated feature is a comedic fable that unfolds in Cheesebridge, a posh Victorian-era town obsessed with wealth, class, and the stinkiest of fine cheeses. Beneath its charming cobblestone streets dwell the Boxtrolls, foul monsters who crawl out of the sewers at night and steal what the townspeople hold most dear: their children and their cheeses. At least, that’s the legend residents have always believed. In truth, the Boxtrolls are an underground cavern-dwelling community of quirky and lovable oddballs who wear recycled cardboard boxes the way turtles wear their shells. The Boxtrolls have raised an orphaned human boy, Eggs (voiced by Isaac Hempstead-Wright), since infancy as one of their dumpster-diving and mechanical junk-collecting own. 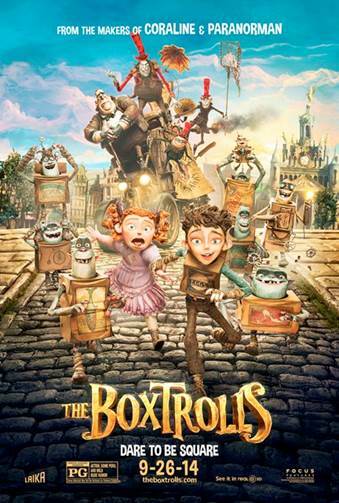 When the Boxtrolls are targeted by villainous pest exterminator Archibald Snatcher (Academy Award winner Ben Kingsley), who is bent on eradicating them as his ticket to Cheesebridge society, the kindhearted band of tinkerers must turn to their adopted charge and adventurous rich girl Winnie (Elle Fanning) to bridge two worlds amidst the winds of change – and cheese.